Like many communities in the Delta, the origins of temple life in Clarksdale sprouted from early Jewish settlers who set up shops in their new community. 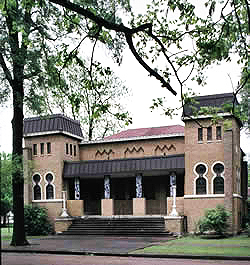 The first religious organization known to Clarksdale Jewry became a reality in 1896, named the Congregation Kehilath Jacob (Congregation of Jacob). At that time, there were only five Jewish families in the city, but the support given to the organzation by Jews from the surrounding area enabled the congregation to worship together at regular weekly services. Some of the earliest meetings were held at the home of Max Kaufman, who later became the first president of the temple. Eventually, services were held in the Knight of Pythias Hall. With a growing number of immigrants from Eastern Europe, the congregation grew into a thriving community that lasted for over a century. Clarksdale business leaders Max Kaufman, Max Friedman and Louis Goldstein led the campaign to construct the community’s first temple. Clarksdale’s non-Jewish residents donated funds to help with the building. In fact, records indicate that local religious leaders urged their congregants to donate from the pulpit. According to member Abe Isaacson, the Borman Lumber Company “donated part of the material required for the foundation of the building,” and the sheriff’s office donated “free prison labor for many weeks.” During the temple’s completion, members had to bring their own chairs to services. With the new temple done by 1910, the congregation changed the name of the temple to Congregation Beth Israel. Louis Goldstein purchased a new Torah for $200 from New York City. Goldstein paid for an elaborate welcoming ceremony at the train station, hiring a band of music, and organizing a parade for all the town dignitaries to participate. Louis Goldstein raised money to pay for the new building within one night by auctioning off the privilege of carrying the Torah part of the way to the new synagogue. After participants donated, they were allowed the honor of carrying the Torah for a set number of paces. By the time the Torah made it to the doors of the new Temple, the balance was fully paid off. The congregation set up a Sunday school in 1916 under the direction of Max Friedman. It boasted 50 students in its inaugural year. By 1939, 131 children went to Sunday school ranging in age from three to sixteen. The small congregation was able to hire Russian immigrant Harry Lubchansky, an unordained rabbi, as their religious leader from 1906 to 1912. Lubchansky was followed by A.H. Freyman, who served the congregation for the next 20 years. Freyman became a revered fixture in the larger Clarksdale community, offering financial and spiritual support to both Jews and non-Jews. In addition to conducting religious ceremonies, he served as the community’s shochet (kosher slaughterer). He also conducted a choir for the High Holidays. Other Jewish institutions were founded as well. Around 1910, members of the Clarksdale community organized a local chapter of B’nai Brith, a fraternal organization known for its work in social and community service activities. This chapter formed the Clarksdale Lodge in the Beth Israel building, which later became the Delta Lodge in 1927. The group continued to be active for decades. Jewish women in Clarksdale were quick to set up community institutions that aided the Jewish community. For instance, the Ladies’ Aid Society was established in 1916 to raise money for the Temple through rummage sales. 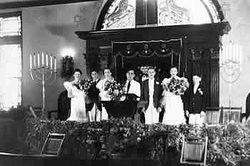 For a number of years, they held an annual New Year’s Ball for the Jews of Clarksdale. By the 1930s, Clarksdale formed a Temple Sisterhood. Jewish women also formed a local Hadassah chapter in 1939. Jewish youth participated in several clubs as well. In the early 20th century, the Semper Fidelis club operated as a Jewish girls club. 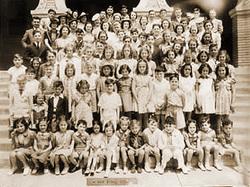 The first children’s youth group established in 1939 was called the Clarksdale Temple Youth League. By the 1920s, the Clarksdale Jewish community was growing rapidly with about 46 families, yet tensions arose between different segments of the congregation. Many members of Eastern European origin preferred the old traditional Orthodox service. However, a youthful generation of native-born American Jews wished to assimilate more and wanted a Reform service with more English and an American style of worship. Tensions became so heated that there was talk of creating another synagogue. Facing this growing rift, the original founders sought to keep the community united. As a result, the leaders of Beth Israel pushed for the building of a new synagogue that would be able to house two different services at the same time. On July 7, 1929, Congregation Beth Israel dedicated its new building at the corner of Catalpa and Choctaw Streets. The Temple was built in a Moorish style with two domes and special memorial windows. The building had two floors, so the community could hold both Reform and more traditional services. Ralph Lowitz, the Cantor, led Orthodox services until his death in 1963. Congregation Beth Israel reached a turning point with the arrival of its first formally trained and ordained resident rabbi. In 1932, Rabbi Jerome Gerson Tolochko arrived from Cincinnati, Ohio, bringing new ideas to a fertile land. Early in his career, Tolochko started a teachers’ training institute for Sunday school teachers, using his own published textbooks to raise the level of Jewish education in the state. In 1938, he created the Mississippi Institute of Jewish and Cognate Studies, a chartered institution with the authority to confer a bachelor’s degree in Jewish history and literature. Under Tolochko’s plan, religious school teachers received a bachelor’s degree through an extra year of training after completing the Jewish program of confirmation. In addition to serving as a source of education in Jewish history, Tolochko hoped that the institute would also build fellowship and understanding between Jews and non-Jews by stressing the similarities among all religions. Students took courses on comparative religion in order to better understand the religious concepts of others. Reflecting the progressive secular pedagogical approaches at the time, students learned via a “Project Method,” whereby students were afforded an opportunity to make ceremonial objects and reconstruct any Biblical scene they studied. Members of the faculty were not all Jewish; some were ministers, while others had experience in regular education. There were ten graduates in 1938, and the plan was to increase the program through the creation of a bachelor’s program in comparative religion. Because of limited resources, the program was only a temporary success. Tolochko’s progressive ideas extended to other areas as well. At times, he pushed Mississippi racial norms. For instance, when an African American Baptist man sentenced to death asked the Rabbi to be his confessor, he obliged, and the two prayed together in his jail cell. After an eight-year tenure, Rabbi Tolochko left Clarksdale for a new life of challenges in eastern North Carolina. Throughout the 1940s, Clarksdale had a series of short term Rabbis. It was not until about 1950 that a rabbi named Alexander Kline stayed for a long period of time. Rabbi Kline soon became well-known for his lectures on art history. His pursuits led him to a larger congregation in Lubbock, Texas. What is the binding tie? The binding tie is love. If we love our dead, they are not dead. If we love our living friends and our dear ones only then are they alive and only then are we alive. It is only in the presence of death that we can appreciate the important things in life. By the 1970s, the Jewish community began to dwindle. Cotton had once been king in Clarksdale, but the decline of the Delta’s cotton economy had caused many Jews to leave the area. Many moved to to nearby Memphis. The congregation persevered with a series of student rabbis from Hebrew Union College for the rest of its existence. In the midst of being an open welcoming friendly neighbor to all the citizens of this community, this congregation did more to diminish anti-Semitism here. Congregations like this are why in large part….we American Jews enjoy the respect and friendship of our neighbors and why American Judaism has flourished. One of its Torahs found a new home at Camp Blue Star in Hendersonville, NC; another traveled to a new congregation forming in Poland. The building was ultimately sold, leaving the Jewish cemetery as the only lasting vestige of what was once a vibrant Jewish community. The memories of this historically significant community live on through records kept at the Institute of Southern Jewish life. A beautiful edifice, and architectural example. That all who desire to learn and worship may enter. Who interprets Mosaic Law page by page. And imbued them with respect and pride for our nation. We give Rabbis and leaders a hearty congratulation. That all who wish to learn and worship, may there enter. Beth Israel Anniversary Issue. June 1939. Clarksdale Mississippi File. Institute of Southern Jewish Life Archives. Clarksdale Temple records, Clarksdale Mississippi File. Institute of Southern Jewish Life Archives. Ferris, Marci Cohen, “Feeding the Jewish Soul in the Delta Diaspora.” Southern Cultures 58, no. 3 (Fall 2004): 52-85. Herscovici, Julius. Rethink Rabbi Benjamin Schultz. Bloomington, Indiana: Xlibris Corporation, 2012. “Historical Edition: Clarksdale, Miss.” The Jewish Ledger, March 23, 1923. Clarksdale Mississippi File. Institute of Southern Jewish Life Archives. Isaacson, Abe “A History of Beth Israel Congregation as I Remember it.” Carnegie Public Library: Clarksdale, MS. Clarksdale Mississippi File. Institute of Southern Jewish Life Archives. Lowitz, Glen, “Introduction.” Action. Jewish Federation of Arkansas, Spring 2011. Clarksdale Mississippi File. Institute of Southern Jewish Life Archives.